If you’ve read my bio snippet on the left sidebar you’ll know that in addition to my wonderful husband and four people kids, I have two feline family members. Today I’m using our biggest baby, and I mean that! 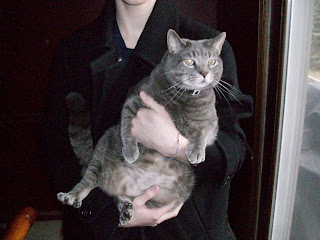 He fusses like a 10 month old even though he is 7 years old. 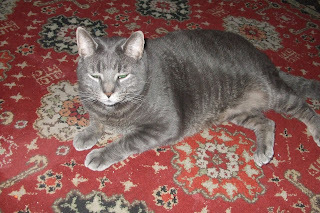 He weighs 17 pounds, snores like a lumberjack and growls like a dog when the door bell rings. I give you Don Sonny Corleone DiPaola (or Sonny to his friends)… OH lest I forget and she get all bent, our other baby is Miss Coco Chanel DiPaola (she is camera shy). Sonny is playing Vannah for us today. 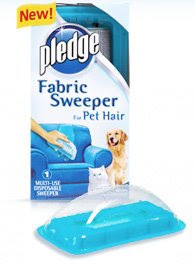 I’ve been asked to review the new Fabric Sweeper for pet hair from Pledge. They tell me that it “…Quickly and effectively removes pet hair from upholstered furniture…”. Since Sonny often finds his way to “nest” on any coat that didn’t make it into the coat closet, I’ve decided to try it out on a coat as well as the furniture. So with the help of Sonny and #1 (my teenage son) I’ve set up my own mommy style scientific testing facility (the dinning room!). 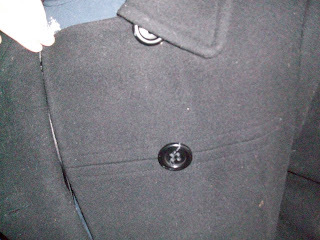 First I’ve asked my son to don my black wool pea coat. 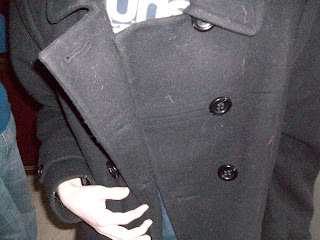 Sonny is grey and yep, I’m the worst culprit in the not hanging up my coat department. I also put it to work around the house. It worked great on my dinning room chair seats and on the office chairs. It did a good job on my sofas, club chair and ottoman, though I use slipcovers there and I had to pull them taught to get all the hairs. All-in-all I’m impressed. It works much better than a tape roller or traditional lint brush. I’m not judging, really.. to each his own! 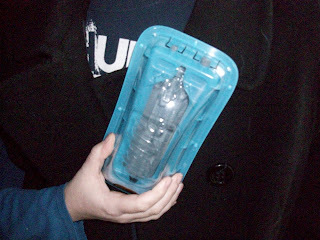 Previous PostMy First Rant…Next PostWhat’s in the box babe?